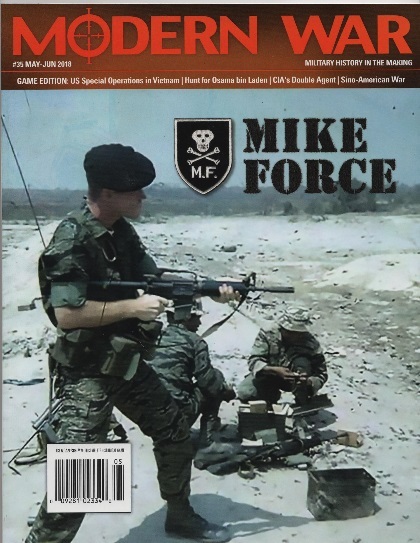 Mike Force is a solitaire game of Special Forces operations during the Vietnam War. If that sentence doesn't get your heart racing then please put down the horse tranquilizers. Joseph Miranda (designer of so many games, why even bother listing them here) is behind this effort. It was published in the current (MAY/JUNE 2018) issue of Modern War. 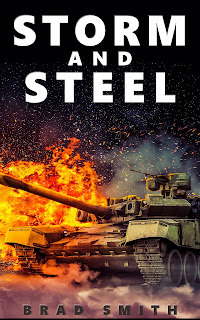 So what you get here is a game that focuses exclusively on the shadowy SOG portion of the conflict to the stubborn exclusion of any other element. It's like the opposite of Nick Karp's zoomed-out look at the conflict in his seminal 1984 game, "Vietnam 1965 - 1975". With the plethora of decent Vietnam War games already out there (Fire in the Lake, Vietnam Solitaire, Vietnam 1965 - 1975, etc. ), you couldn't be blamed for asking the question: Did this game need to be made? And the answer I would give is "Yeah. Sure." Because this game is the war's underbelly that you rarely get glimpses of anywhere else. And also because it shows you how small units could influence the course of the war. Lots of other Vietnam games depict the large-scale use of US military power against small VC units in the field. In those games, you really are trying to hit a gnat with a sledgehammer as American infantry battalions conduct large-scale operations in an attempt to track down an elusive enemy that disappears into the jungle each and every time you try and pick a fight with them. This game takes a very different approach to the war. Here, you command the agile strike forces of small but highly trained teams of men who track and kill the infiltrating NVA and VC as they come into South Vietnam. You'll push around counters that represent six-man A-teams and you'll curse and shout when they get overrun by a battalion of NVA. You'll send in hatchet teams to conduct recon missions and cheer when you call in an airstrike and see a VC supply depot get wiped out. Or you'll conduct PSYWAR operations and watch in frustration as the operation gets blown. You'll recruit and lead Hmong villagers to take out targets as they come down the Ho Chi Minh trail. 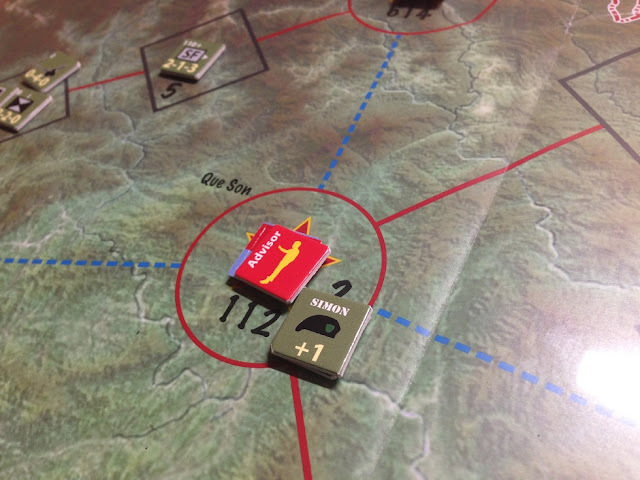 All these tiny pressure points push the war in certain directions, affecting enemy morale and operations as they infiltrate South Vietnam and push towards free world strongholds such as Hue and Da Nang. Mike Force really captures the feel of these small unit actions and how and why they fit in to the overall conflict. It also gives you an idea of how special operations were forced to operate within the framework of military planning at the time. 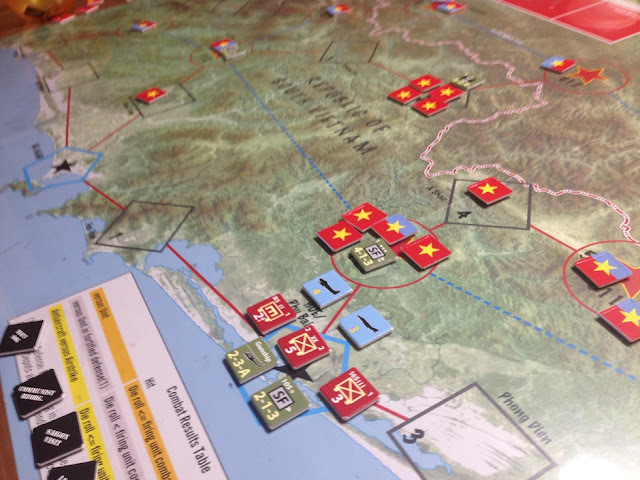 Each game is seven turns long and takes place on a map depicting the area of and around South Vietnam (this includes parts of Laos and North Vietnam). The various spaces on the map show different types of terrain and base areas. These spaces connect to each other to form infiltration routes that the communists use in order to eventually capture key cities in South Vietnam. There are four scenarios included in the game, each of which takes place during a different stage of the war. The game starts with random draws of communist unit that are placed face down by the players in the different communist bases. There are two types of communist units - mobile and static. Static units are quite often "soft" targets such as supply depots and motor pools or advisors. But you might run into some infantry there too. On the other hand, the mobile units are usually infantry and some of them are pretty well-equipped and can put up a hell of a fight. My A-Team led by Cpt. Simon finds a Soviet adviser at Que Son. Your units are varied. You get everything from SF camps to CIDG units to gunships and transport helicopters. You also get White Star teams that are airborne-capable, PSYWAR units, MACV SOG support units that include air support, etc. Basically, you get an entire toolkit of units to choose from and you can fight your war however you see fit. Be warned, however, that you need to spend Resource Points (RPs) to purchase these units. And pretty much the only way to get RPs is to rack up the body count and impress the guys back in Washington. Anyway, you set up your units and each game turn follows the same pattern. You draw a random event from the cup and implement it. After that, you can recruit forces by spending RPs. Then you move your guys around the map and conduct recon missions. If you manage to succeed at a recon mission (by rolling against the concerned unit's recon value rating), then you flip over the enemy unit to reveal what it is. Then you can react to it by sending in airstrikes or transporting units into the combat zone by helicopter. After that, the combat phase begins and you line up all the revealed enemy units to face off against your own units in the same space. You roll for tactical initiative (against one unit's recon value) to decide who rolls first in the attack phase. Results are implemented immediately so having tactical advantage lets you get the first shot in without having to worry about return fire. After the winner is declared, you conduct the body count. Each enemy unit has a BCP (Body Count Point) on it. When you kill an enemy unit, you can choose to either increase your number of RPs by the same number of Body Count Points - or you can decrease the enemy infiltration points by the same number of BCPs. Conversely, losing friendly units means either decreasing RP or increasing IP. The last half of each turn is given over to the communists. The phases are pretty much the same. You choose an Event from the cup. Then you roll a die and consult tables to determine both how many new units the communists can recruit (this largely depends on the communist infiltration level) and also what the general strategy of the communists will be for that turn (also depends on infiltration level). They might stop and lick their wounds, advance, or withdraw. Enemy units will ultimately try and go for Da Nang. If they manage to capture it, the free world player automatically loses the game. But even if they don't get it, they can also inflict some pretty bad VP losses by capturing other free world bases such as Hue or Khe San. After communist movement is conducted, the free world player again can conduct reaction airstrikes and other missions against revealed communist units in the same space as friendly units. Mike Force is a pretty easy game to learn. I was clear of the rulebook after my second playthrough. An average game will take anywhere between 1 and 2 hours, which hits my "sweet spot" for gaming these days. The rules are fairly simple and well-written and organized. I had no problem finding information I needed. The rulebook is 16 pages long. There are 30 sections, each of them with a few subpoints underneath. I found the rules quite intuitive after a very short time. Joe Youst drew the map and it is beautiful. More importantly, it facilitates gameplay. There is plenty of space for the game's units without having to resort to stacking them. The graphics and font captures the era and theme of the game quite well. The large size of the font makes it easy to read and quickly find information. Tables are included on the map, not in the rulebook or the magazine (thankfully). The counters are nothing special but they're functional and easy to read. The free world counters show recon value, combat value, and movement values underneath a NATO symbol. The communist counters show a single combat value along with its BCP. Infantry units get a NATO symbol. Other units get a nice silhouette. For me, a good game is one that teaches me something new and presents me with lots of interesting choices. Did I learn something? Yes. 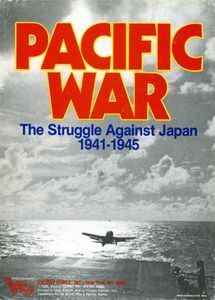 I learned about another aspect of warfare that's often glossed over or ignored in wargames. Before I played Mike Force, I had no idea how unconventional forces played a role in Vietnam and how they were used. I came away from the game with a better appreciation for a.) how the definition of progress (body count) colored everything that happened in the war and how it was conducted and b.) the huge amounts of firepower that could be called down by just a few men in the right spot and how this ultimately influenced morale and the enemy's ability to move men and material down various routes. More importantly, I have a better understanding of why these units exist. They conduct very high-risk operations that require extensive training. The most important role these guys played in the war was to pinpoint enemy positions and serve as the eyes and ears of what was out there. To survive and do their jobs well, they need a hell of a lot of support. Without it, they are mostly sitting ducks. For this reason, you have to have a good sense of when to push an operation and when to hold back. First, there was the unit variety. As I mentioned above, there is a very wide variety of forces that you can purchase and they all do some things better than others. Some of them are fragile and finicky. You can spend 5 RP on a PSYWAR operation that can either get blown in the very next turn or ends up turning things around for you. You can try to recruit Laotians into the White Star program and end up with a potent force to work with - or you can end up with nothing. You can ask for MACV support and not be given the kind that you really needed. Yes, luck is a central part of it. But so is the ability to play the hand that you are dealt. I can see how some players might not enjoy that though. Another interesting choice is the agony of whether to increase RP or decrease IP when conducting Body Counts. In my first game, I chose to decrease the Infiltration level and managed to keep it to a "Medium" level. However, I didn't have any points to recruit new guys so I ended up getting hammered by the enemy and losing what little forces I had. 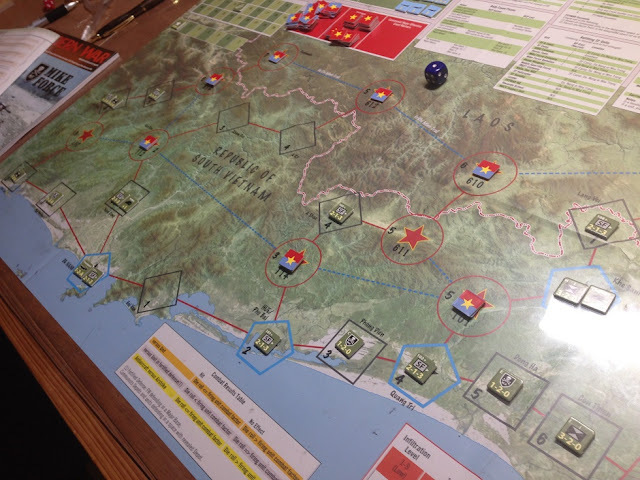 After that, my choices for hitting the NVA were extremely limited as I watched them pour into Hue. It was only through some last minute air and gunship intervention that I managed to save it from being overrun. Good review, Brad. Sounds like an interesting game. Yup - you've sold me on that- now to track down a copy.